Anatomy of a mileage run. For those readers that follow the detail of fare deals more closely, may well be aware of Cairo as a starting point for very good value premium fares. Not only do they tend to be keenly priced, but they can also be more flexible than similar fares from other European starting points which can be totally non-changeable and non-refundable. However, the downside is that Cairo is harder to get to than somewhere like Amsterdam, Barcelona or Stockholm and Egypt has a reputation for being less secure than most places in Western Europe. If you’re comfortable with those caveats, for those that are interested in getting to Hawaii, there are some excellent fares originating in Cairo, to Honolulu, that could earn 820 tier points with British Airways in one go. My concerns about originating somewhere like this and travelling to the US, is that immigration authorities may subject you to greater levels of screening. This is entirely understandable given the current threat levels. However there are also some good deals heading eastwards which I would fewer qualms about booking. This article goes into a lot of detail (and is quite long) about how to find fares, how you can work out what you’re allowed to do, then how to see when it is available, and then finally work out a price. In a previous post I mentioned Expertflyer as a tool that I pay for given how useful it is. It helps to have an understanding of how airlines sell and price fares before diving in though as it can give a lot of data that isn’t necessarily obviously interpreted. If you’re comfortable about how airlines sell and manage inventory, then it is a worthwhile investment. 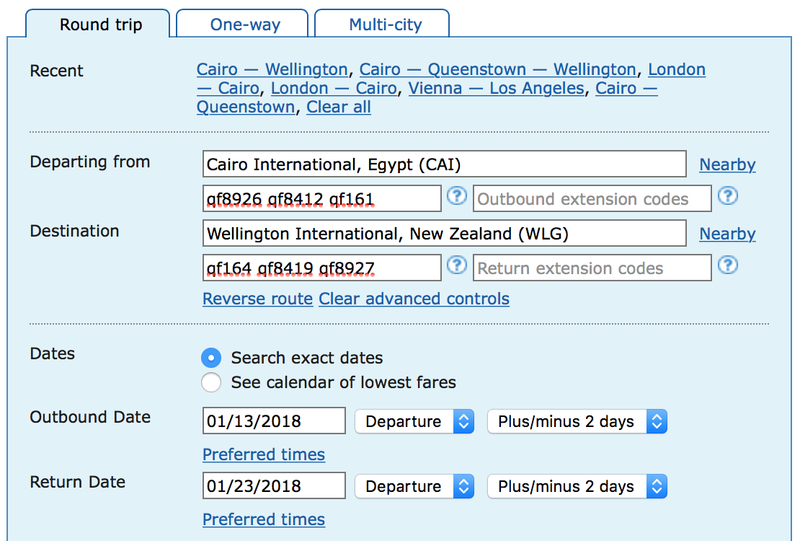 While playing around with it in the last couple of days, I found a rather good deal – a Qantas fare from Cairo to either Wellington or Queenstown in New Zealand. The price was around £950 exclusive of taxes. Once you add in all of the fuel surcharges, taxes and fees that increases to between £1500 and £1800 depending on what route you want to take. The screenshot below shows the fare display which probably won’t mean a lot to people. 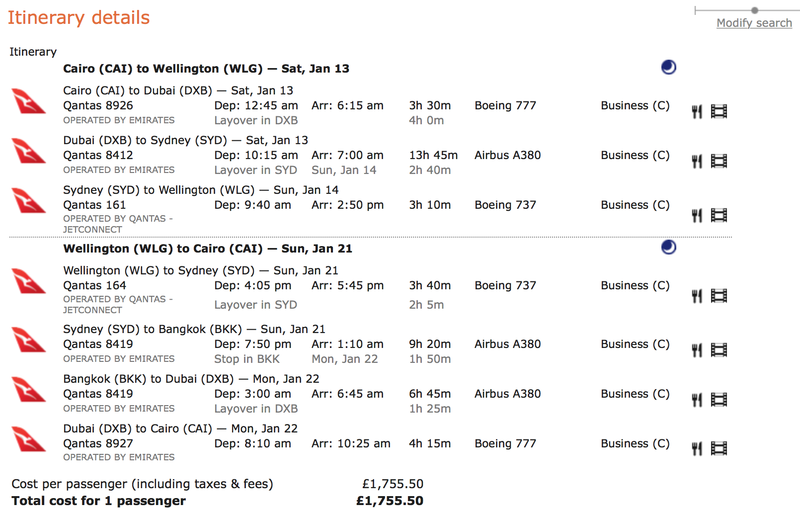 It’s showing business class fares, in increasing price, between Cairo and Wellington. The top one is the rather good value Qantas fare, with basis CSEG. Now having been to Wellington, it’s not exactly the gay capital of the world, despite it being the capital of New Zealand (no offence to my wonderful Kiwi friends). However, it would be nice to head down under for Mardi Gras which is a hop, skip and a jump away (relatively speaking) in Sydney. I looked into it a little deeper, wondering if it was possible to re-purpose it. When looking at fares, there are a number of things to look at to see if they’re suitable for going where you want. I touched on this a bit in my article about picking a route to Hawaii, but lets dive in a little more detail. This fare is what’s known as a “routed” are, meaning that the ways you can get between the two points are explicitly defined in the rules. For example, I’ve listed the routes that are allowed below. 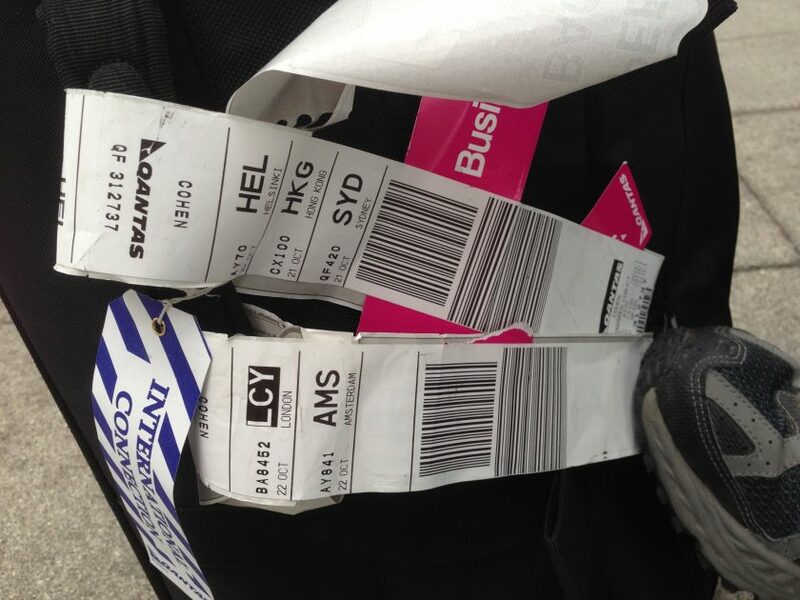 If you notice nearly all of them contain SYD, meaning I have to fly via there. Which is great, because I want to stop over there, before continuing on to Wellington. A STOPOVER MAY NOT EXCEED 30 DAYS. What that means is that as long as I adhere to the routing rules above, I can have as many stopovers as I want. For clarity, a stopover is any connection that is greater than 24 hours. So I can have an overnight at an airport for example landing somewhere at 19.00 hours and as long as I leave before 18.59 the next day, that’s not a stopover. In this case, it appears that I can stop in Sydney for up to 30 days, for free. Airlines also have something which they call the higher intermediate point rule, sometimes known as a “HIP check”. This is one of those rather arcane gotchas which you need to be aware of if you are considering a stop over. Even if a fare says that stopovers are allowed, it may still not work, or may make the ticket very much more expensive. For example, if you want to fly, LHR-JFK-LAX and stopover in JFK for a few days but want to pay the LHR-LAX fare, it might not work. Unless there is a HIP exception, or some other wording, the airline will make you pay for a LHR-JFK and a JFK-LAX, rather than than a LHR-LAX fare, with a stopover in JFK. Next, lets look at the penalties section. Again, this can sometimes have many, many provisions so I’ve only reproduced some of it. CHARGE EGP 300.00 FOR REISSUE/REVALIDATION. CHARGE EGP 500.00 FOR CANCEL/REFUND. At the current exchange rate, EGP300 is about £13 and EGP500 is about £22. That basically means that it’s fully flexible and cancellable for the cost of a couple of cocktails in central London. EK FLIGHTS 009 THROUGH 024. 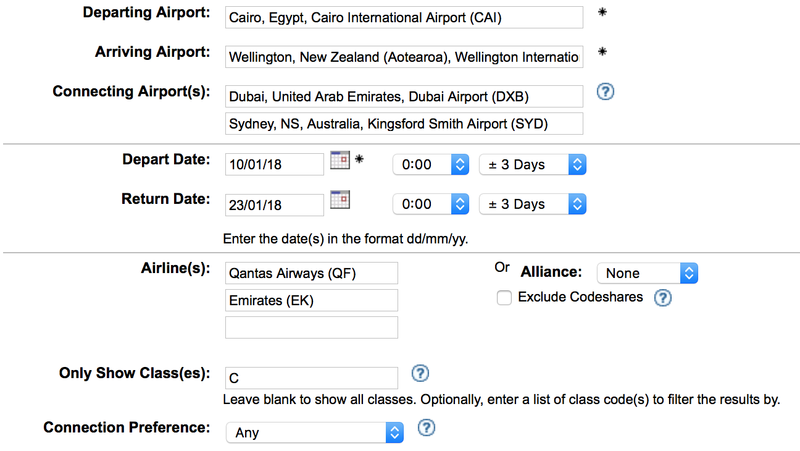 In this case, there’s a list of certain Qantas and Emirates flight numbers that we can’t take, plus a list of carriers that the fare must be on. In this case we’re restricted to Qantas, Emirates, FlyDubai, EgyptAir and Jetstar. There are also a whole load more provisions in the fare rules that I won’t go into, however putting all of these together and we actually have a pretty good fare that’s not very restrictive at all. The other really important bit is availability. We need to understand how many seats an airline is willing to sell at a particular price point. Airlines do this by displaying how many seats, in a fare bucket they are willing to sell, on every single flight they operate. In my case, I’m going to be flying SIN-SYD for one of my segments. The screen grab below shows the availability for a flight on the 17th June, at this exact point in time that the article was written. If you go back and check now, it may well give you a different result. On the right, there’s a series of letters and numbers. The most expensive fares are to the left, and the cheapest are to the right. In this case, the cheapest fare is a “G” fare and it has a “0” next to it, which means that they won’t sell any G fares. The next cheapest is a “S” fare and they are willing to sell only one seat at that level. So if there are two of you travelling, then you would need to pay the “L” fare as they will sell two. In the case of this particular fare, we have a C fare, which in the case of Qantas, is the second highest in their list. Which is great. So we now need to look through what route we want, and check if there’s a seat in “C” class available on every single segment. So the more complex the route, the more flights we need to look at, and the the more chances are that we can’t book it (if there’s no C class). So now we know that every flight we want has availability, we can go to ITA Matrix and plug it all in to see if we can get a price. From the availability display, you can see in the advanced section if entered the specific flight numbers. Clicking through, we’re then presented with the final price. With the blue box at the bottom, giving all of the details. We can see that the fare basis is CSEG flying with QF which is exactly what we picked out of Expertflyer right at the beginning. So we know it’s work and that a travel agent, or online site should be able to price it. So now we’ve got the A to B and back to A, how do we customise it? I mentioned at the start, that I wanted a ten day stopover in Sydney to visit Mardi Gras. Plus I’d like to route via Bangkok (or Singapore) for extra segments, extra miles and extra points. Well, this is where it gets complicated. For multi-sector itineraries like this, with stopovers in particular, I’m yet to find a website that’s able to book them reliably. It’s simply too complex to get exactly what you want. Plus throw in codeshares and it all gets too much. It’s where travel agents still have value and very much earn their keep. So I wandered down the high street and went into my local Flight Centre, in this case the one in Oxford. The very knowledgeable manager, Jack, helped me price up exactly what I needed; really can’t recommend him enough. There was some playing around in terms of switching codeshares around, which remarkably does make a substantial difference to the overall levels of fuel surcharges. He also mentioned that he’s very happy to help with any other readers bookings too. It’s complicated. Very complicated. I’m learning new stuff about this all the time. However there are deals to be found. Fares like this can be very flexible for a fraction of the price of a regular fully flexible ticket that can cost many thousands. There’s lots of help on the internet though, so do have a go, and feedback any questions that you might have. Previous Post: British Airways releases extra Club World award seats. Kinda. Next Post: US Transcontinental flights for under $250. Thanks for a very thorough step by step guide. I’m confused on the price, though. The fare basis is circa GBP960 but the Matrix price is GBP1755. Why the significant difference? It’s *all* down to fuel surcharges. Depending on whether you code things as EK or QF can make a significant difference to how much you pay in the end. It’s worth having a play around with matrix to see what combination works best, but I’ve definitely found that having the CAI-DXB under the EK codes reduces it significantly. Thanks for that. I wasn’t able to replicate the fare on only EK flights but no doubt I’m doing something wrong. I don’t suppose you’ll be doing any further posts on how to construct fares using information from EF? It’s actually a QF fare, not an EK fare. The post on FT is incorrect in that regard. As for constructing fares from EF, yes, I’ve got one in draft at the moment. Hopefully be up in the next day or so! I’ve been researching this QF CSEG fare on ITA Matrix lately, and have a couple of questions stemming from this (great!) post. Where did you pull up those detailed routing rules? ITA Matrix’s Fare Rules button gives a lot of the fare information text you’ve quoted here, but not that section. ITA Matrix has a “Only show flights and prices with available seats” checkbox that I leave selected. So I’m hoping that when I look at particular days and matrix shows me a flight with a C fare, that means there really is availability in that fare bucket! I think I read ITA Matrix caches this information, but hopefully it’s not too out of date and mostly reflects actual availability? If you travel frequently, then Expertflyer pays for itself during disruption. If you’re able to point out to an agent where a particular flight as availability and you’d like to get booked on to it, rather than wait x hours/days to get what you’re given, it’s a god-send.